We've all heard that a captain should never be without his first mate. 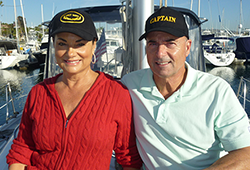 For sailing enthusiast Ron Latin, his first mate is his lovely wife, Cindy. "When we're accompanied by a group of dolphins swimming effortlessly along the bow of our boat or encounter a whale gracefully coursing through the swells, it takes our breath away," Ron says. Together the Laguna Niguel couple have journeyed the world, navigating the ocean around destinations like Croatia, the Greek Isles and Thailand, among others. But Cindy is not just Ron's first mate on the high seas. The two are true partners in creating a culture of philanthropy in their family, as well as among Ron's clients in his financial planning and wealth management practice. The best way to do that, Ron says, is to lead by example. Ron and Cindy have named Saddleback Memorial Foundation as a beneficiary in their charitable estate planning, as well as contributed to current Foundation efforts through their own giving fund. After Ron was treated for appendicitis at MemorialCare Saddleback Medical Center in 2005, he and Cindy realized how important it was to ensure that the community's most comprehensive medical facility would have the best doctors and medical technology available. It simply made wise, practical sense to financially support the facility so everyone in the community could continue to receive state-of-the-art care. These philanthropic core values are the foundation for Ron's refreshing approach to !nancial planning: Ron helps his clients not only grow their wealth, but helps steward a portion of it toward accomplishing good in the world. He challenges his clients to connect their charitable intentions and resources with causes and organizations that share their values - things that truly matter in their heart of hearts. "We encourage others to experience the joy of generosity," Cindy adds. "The amazing thing is that once we committed to giving generously, we have been blessed with more." As a financial advisor and advocate of Strategic Generosity - a signature talk Ron delights in giving whenever invited - Ron shares that charitable tax planning can help one increase philanthropic giving while reducing taxes and increasing personal cash flow and wealth. Appreciated assets for charitable giving in designated funds can grow in value on a tax-free basis so one will have more capacity to give. The Latins have established accounts they will pass on to their three adult children, so they will also be led to give and make philanthropy an essential part of their lives. "Our God has blessed us with talents and treasure," Cindy and Ron said. "Not simply to raise our standard of living but to raise our standard of giving. Giving is the antidote to materialism. That is the legacy we want to create." We're all on board, Ron and Cindy.